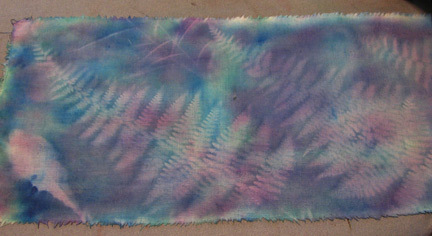 Looking through some of my piles of unfinished fabrics (unfinished in the sense that I haven't used them for a project yet), I came across this sunprinted piece that I think I painted back in 2005. I couldn't believe that I hadn't used it for something...time to fix that! Although I considered a meandering path of thread and bead embroidery, in the end I decided that I didn't want any more of the sunprinting obscured than absolutely necessary. So I decided to create a lacy raised flower design in white, crystal, and gold tones. The inspiration for this design came from Nancy Eha's Bead Creative Art Quilts. I was fortunate enough to take a class with Nancy a number of years ago, and this design is a much-simplified version with my own twist. I don't use all the exact methods that Nancy does, so any failings in this piece are completely my own fault! 1. 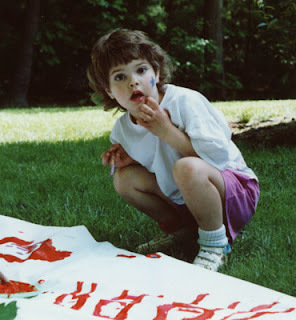 Start with a painted or printed piece of fabric that you want to embellish. 2. Cut a piece of fusible interfacing and iron it to the back of the fabric where you plan to add the beads. 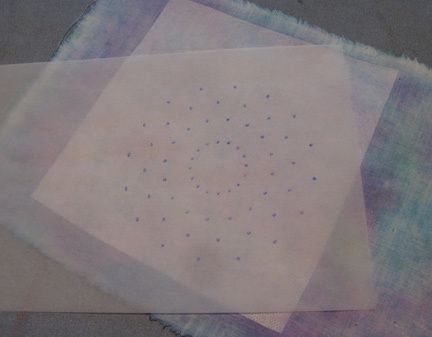 Use a piece of very lightweight paper (tracing paper works great) to draw dots where you plan to add your anchoring beads. Nancy's book has several wonderful patterns that you can use, or you can create your own. 3. Pin the pattern to the front of the fabric and stitch small stacks of beads to each dot to create anchors for your raised bead design. 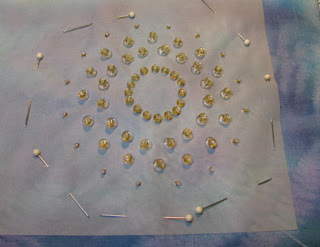 Nancy's book, Bead Creative Art Quilts, teaches you how to make a much bigger, multi-layered version of this flower. 4. 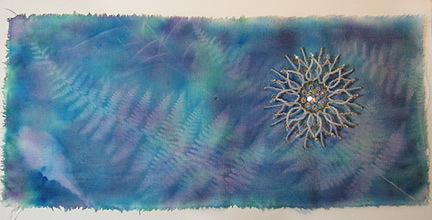 I love how the finished flower floats above the surface of the fabric. Cyndi, your piece turned out beautiful!! Thanks for sharing your process (and tips). It's wonderful! I'm glad you finally got around to using that lovely sunprint fabric. It's too pretty to be hidden away - especially now with the bead embellishment.